These sandwich wraps are perfect for Sunday dinner, or for serving to a crowd on game day. They’re easy to assemble and are teeming with flavor. Wondering what to make for Sunday dinner? 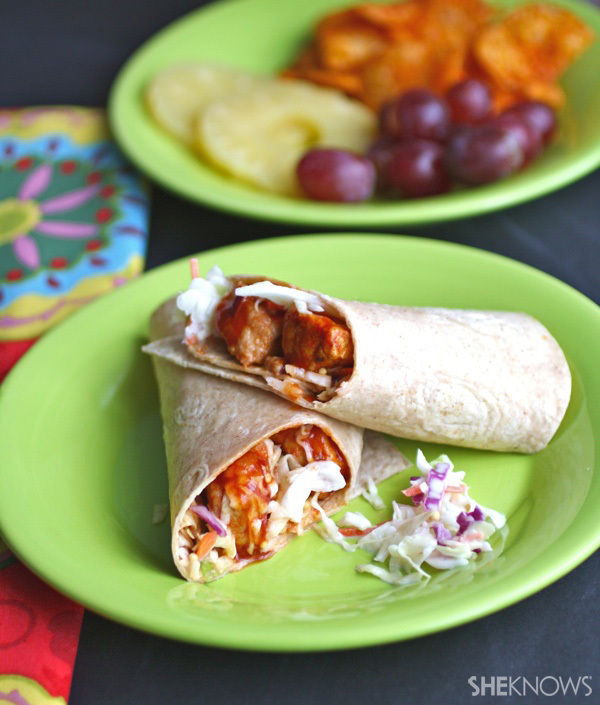 I think you’ll like the way these sweet and tangy pork & slaw sandwich wraps come together! As a sandwich, you’ll find these are heartier than most, and they’re so easy to make. Thick bites of pork are smothered in a sweet and tangy sauce cooled slightly by the crunchy, creamy coleslaw. All you need to do is wrap these babies up and serve them to your hungry crowd. Speaking of crowds, these would be great to serve to friends gathered at your place on game day — it’s just around the corner! Place the cubed pork loin in a Dutch oven. Add the onion, garlic, salt, pepper, chili powder, honey and olive oil. Use your hands to lightly rub the mixture over the pork. Cook with the lid on for 15 minutes. Decrease the oven temperature to 300 degrees F. Cook another 20 minutes. Remove from the oven, stir the mixture, place the lid back on and let it stand for another 5 minutes. About 15 minutes before the pork is finished, add the all the ingredients except salt and pepper to a saucepan. Stir the mixture and bring it to a bowl. Reduced the heat and simmer for about 10 minutes. Taste and adjust the seasoning as needed. When the pork is ready to serve, pour the sauce over it and mix to coat. To make your sandwiches, lay out your sandwich wraps on a flat surface. Add a few heaping tablespoons of coleslaw across the bottom of each, followed by a heaping serving of the pork. Roll the sandwiches up as tightly as possible and slice them in half with a serrated knife. Place on individual plates, seam side down. Use toothpicks to secure the sandwiches if you’d like.